A lube job refers to the greasing and lubricating of key moving parts of your vehicle, including those vital to your suspension, drivetrain and those found in the engine bay. 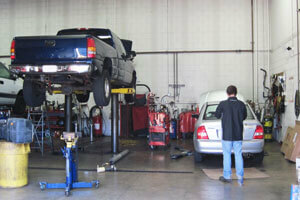 In most vehicles, you should have a lube job performed by a certified mechanic every 3000 to 4000 miles. This seemingly annoying, painstaking task can be performed in a relatively short time by an experienced, knowledgeable mechanic in any good garage, even if the job is not full service. At a minimum, this task should be performed at least annually or semi-annually. Weather changes can greatly affect your vehicleâ€™s performance, and ultimately its duration of life, particularly if you live or work in an area that experiences extreme weather changes or extremely hot or cold conditions. In fact, it`s easiest and perhaps wisest to go ahead and get a lube job while youâ€™re getting your oil changes. A lube job, like an oil change, is an extremely important piece of a complete maintenance care package for a healthy car. Even newer vehicles with sealed bearings, automobiles that supposedly do not need lube jobs, should be checked by a mechanic from time to time to make sure that the bearings are still sealed. If you’re not sure whether or not you need a lube job, you should have a mechanic take a look at your car just in case, especially if you hear rattling or chirping noises. Ignoring the issue could cause serious damage to the moving parts of your suspension, drive train or engine bay. Our qualified mechanic, located conveniently in (AREA) can give your car a lube job at an affordable price in a relatively quick period of time. It`s certainly much cheaper and less time consuming when compared to having to find a new vehicle. So make an appointment as soon as you can to bring your vehicle in for a simple oil change or a lube job, as preventative maintenance is important to the performance and health of your vehicle. You won’t be sorry you took the time and effort to undergo such a simple experience.